It is with a very heavy heart that I must relay to you all that the actor who portrayed the original Godzilla (and other numerous kaiju), Haruo Nakajima has passed away at the age of 88. Haruo Nakajima played Godzilla from 1954 through 1972’s Godzilla vs. Gigan. He was Toho’s primary kaiju actor and helped bring monsters like Rodan and Varan to life. In his later years he made many appearances at conventions around the world. I was lucky enough to see him at two of those shows. I feel fortunate to have been able to interview Nakajima during 2014’s Fear FestEvil convention in San Francisco, California. If you’d like to hear that brief interview, it’s in episode #104 (and the interview starts around the 11½ minute mark). At that same convention, a panel titled “Oh no! 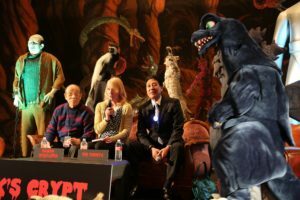 There goes Tokyo!” featured both Haruo Nakajima (the original Godzilla suit actor) and Bin Furuya (the original Ultraman suit actor) and was moderated by Jim Cirronella. The audio is not as great as I’d like, but I’ve always thought about releasing this as a special episode. This seems like the best time to do that since I won’t be able to produce any other episodes featuring this legend of the genre.